Brown spots, sun spots, age spots, liver spots: you’ve probably heard dark spots called many different things. Some of the most frequently asked questions I get are related to the dark spots people find on their face and hands. What are they? Will they turn into liver spots like on my grandmother’s hands? More importantly, how can I get rid of dark spots? So the dark spots you see on your hands and face are probably from sun damage—over exposure to the sun where your melanin has rushed in to try and protect the skin. Remember, melanin, the pigment in our skin that protects us from the sun’s rays, is our own natural sunscreen. The whiter your skin, the more likely you are to produce freckles, dark spots and sun damage. So if you’re born with fair skin, which doesn’t tan and burns easily, then you don’t produce much melanin. Sun damage can lead to dark spots, freckles, pigment which in turn can lead to skin cancer. Sun damage can occur in African-Americans just as it does with other skin types. Even though African-Americans have more melanin in their skin, it doesn’t protect the skin completely from the sun’s damaging rays nor from skin cancer. Dark spots and blotchy skin tone can be found on African-American skin also. Another type of dark spot I want to mention is Melasma. Melasma is directly related to hormones, pregnancy and birth control pills. All these situations can tell the skin to make more pigment, which in combination with light can produce too much pigment. Melasma definitely looks different then dark spots from sun damage. 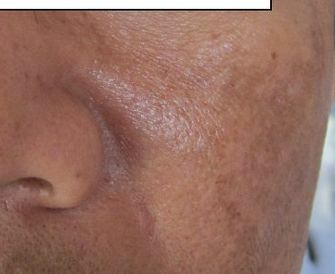 Often brown, blotchy patches with a mask-like appearance can be found on the cheeks, forehead, and chin.